Ladies, without layers, your hair is just going to look flat, boring and dated! That’s why you need to get a haircut every few months. Opt for bangs and layers so that your features look fresh and your hair gets that healthy bounce. If your mane is all one length, it’s definitely time for you to try a new style. Keep it fresh, keep it modern, and experiment if you have to! That way, we bet your avatar will always look stylish and trendy AF! Over-bleaching your locks just focuses so much attention on your hair, rather than your pretty face. The key to is find a hair colour that compliments your skin tone. The kind that’s not too jarring nor too subtle, the right hint of colour will make you look like a fountain of youth. Opt for highlights in shades of crimson, raven black, chocolate and honey brown. These colours are bound to fetch you a dozen compliments! Do not get a blunt fringe unless you want to add a few years to your age. Pay attention to your face structure as well. If you have a small and round face, this cut won’t work. To pull off a full fringe, you must have a long, broad face. So while a blunt fringe may work for some girls, it ca look too severe on others. Pay attention to your face shape and settle on the type of bangs that will flatter you best, with the help of your stylist. Parting your hair in a particular way could also take a couple of years off your face. 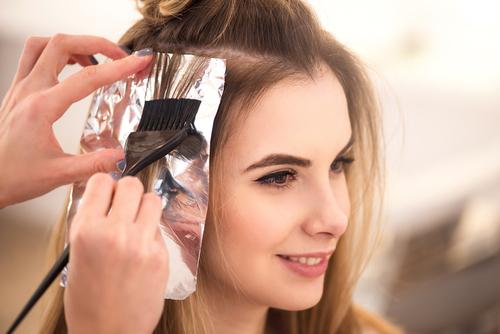 Play it safe by sticking to right, center and zig-zag parting. Straight, fine hair is easier to manage, but the lack of volume makes you look older than you should. No bounce and no shine, makes hair look unnatural and meh. For naturally straight hair, opt for bangs, layers and colour. Turn the volume up, by blow drying your hair upside down. Back-brushing your strands, a root lifter spray or even using a volume-building shampoo will help add volume and lushness to your hair! We know many of you ladies can’t go a day without using volumizing mousses, hair gels, serums, fixing sprays and what not. 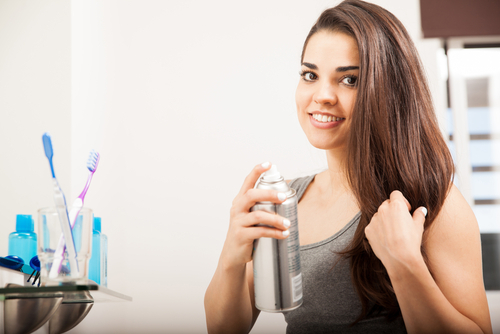 However, using too many styling products can damage your hair and create buildup on your scalp. Stick to just one light-weight product, instead of multiple. If you do use more than one, check the ingredients and make sure the products complement each other. Invest in less so that the results are the best. Afterall, everyone knows that less is more. What happens is that when hair lacks moisture, it shrivels. When it dries up, you can expect it to be dull, rough and frizzy, which in turn, can make you look older. You should moisturize your hair and make sure that your locks stay nourished and healthy at all times. 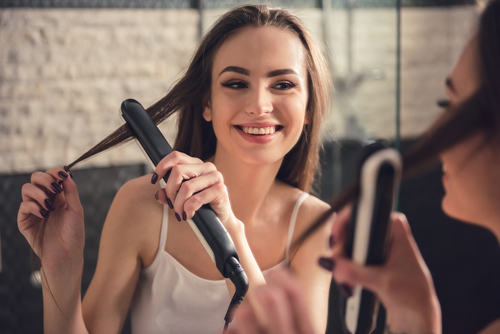 No matter how much you love your blow dryer and flat iron, we want you to know that using them everyday can dry your locks out and damage your hair. The golden rule is to whenever you use these hot styling tools, make use of heat protectant products as well as deep conditioning masks regularly as they keep your locks moisturized and healthy when exposed to heat. Did you know that damaged, split and frizzy ends can make your hair look messy and dull? What’s even worse is that they can make you look older as well! What you could do to address the issue is to trim your locks every two months. Occasionally pamper your strands by using natural hair masks, deep conditioning packs and rejuvenating hair treatments to prevent any more of those pesky split ends. 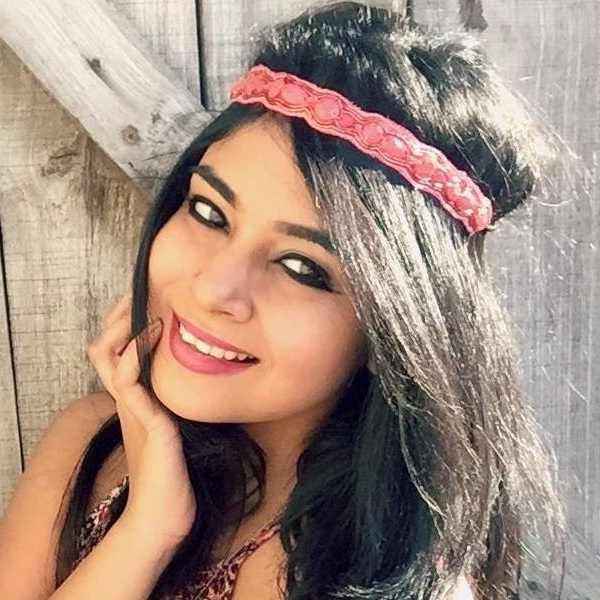 Having Rapunzel-like long hair can make you look older, and tomboyish haircuts have the tendency of making you look like you just graduated from college. The key here is to find a balance. The kind of hair length that’s around your shoulders. If you fancy the short hairstyles, the bob and the pixie are your best bets. If you prefer to go long, make sure to incorporate chic, long layers for plenty of shape and bounce, but refrain from going super, super long.